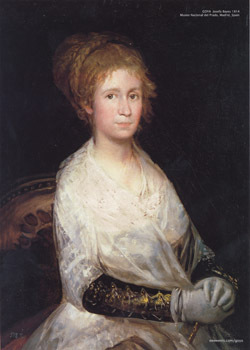 Revised summary about this image: In some quarters there is a dispute about whether this painting is actually of Goya's wife Josefa, or some other unidentified sitter. Some modern experts are suggesting the sitter for this portrait might be Leocadia Zorilla de Weiss. Evidense about the clothing style and the lighting in the painting dates the image to 1815. However, the hair styling suggests the timing is from the 1790s during the French Restoration (see page 207 from the book Goya:Images of Women, section written by Aileen Ribeiro, published by the National Gallery of Art, 2002). To view Goya's charcoal drawing of his wife go here. BIO | ARTWORK | BOOKS | RESOURCES FOR STUDENTS | LINKS | CONTACT | NEWS | NEWS | STATS | F.A.Q.